The reveal day is finally here. My bead soup has been transformed into a necklace and an unfinished pair of earrings. The only reason the earrings aren't finished is simply that I used up all my jumprings and haven't been able to get to the bead shop. I'm not 100% certain I won't add more beads or some copper balls to them, anyway, or even a dangle, perhaps. I was left with only one of the gorgeous roses, a 4mm Czech bead and two of the darker glass pearls. I still have the other two clasps, because my generous bead soup swap partner sent me a choice of three to use in my design. Don't forget to take a look at what Éva Kovács made. Wow, I just went and visited her blog and am totally impressed. Join in the blog party by visiting the other blogs and get some eye candy into you. Hostess Lori Anderson has the list here. Be sure to scroll down to the third list of participants. GORGEOUS! Wow! I would leave the earrings as is and see if it was possible to add post instead of earwires. The earrings are going to be great. Beautiful necklace! Gosh, you were sent the most wonderful Soup! What a beautiful set you made with it. Stunning! Wow Heather, your pieces are gorgeous I love them! 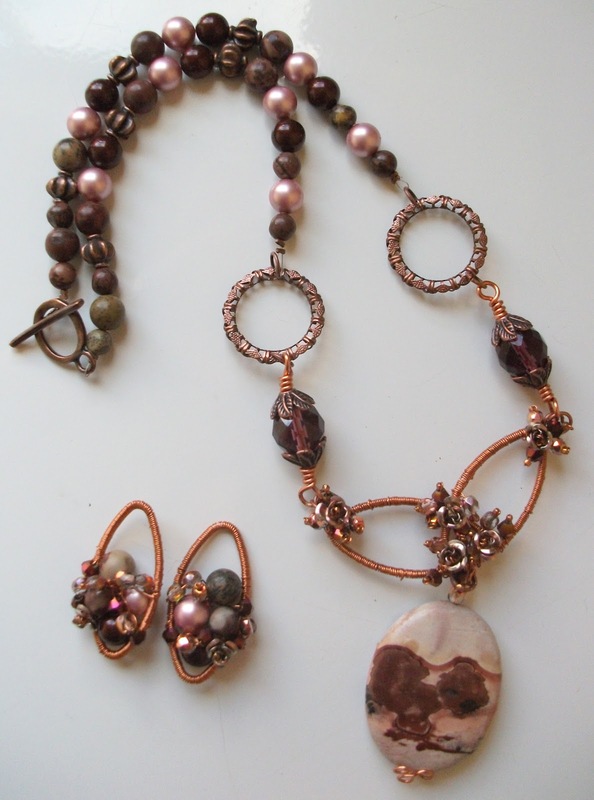 Gemstones, pearls, crystals and copper oh my! Great wire work! Love them! Very pretty. I really like all the wire-wrapping you did on the earrings and on the pieces for the necklace. Very spectacular works!Are fantastic pieces !Congrats! What lovely wire work you've incorporated into your designs..really top notch! Great job. Love the wire work on those earrings. I'm beginning to really like copper! Yours is awesome! Your creations are beautiful! Your wire wrapping is awesome...I've got to get better at it! Stunning work! LOVE those links! So rich and beautiful!!!! I like your style. Your designs are awesome! I have a suggestion. You have wire maybe try making your own jumprings. It isn't hard and adds another personal touch. Those earring are going to be incredible once you get them finished! Beautiful pieces - your wire work is amazing!! Gorgeous, i really love set. great design! Outstanding! love the necklace and earrings - wonderful designs! Another amazing piece on my favourite list!! I always admire wire-workers! Earrings are fabulous! Nice wire wrapping. Great job, beautiful pieces. beautiful conglomerations! 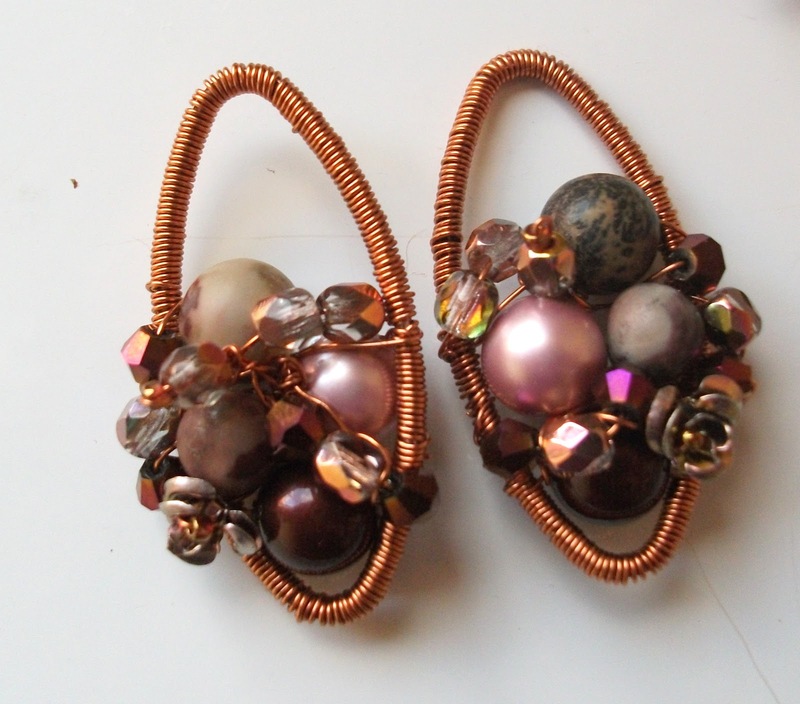 your wire wrapping is exquisite! Beautiful work. Those earrings are fantastic. What? No time to go to a bead shop? What could possibly be more important than that? Gorgeous designs and color palette!!! oh, beautiful design!! I specially love the necklace!! Beautiful!!! Those earrings are going to be spectacular when they are finished. And the necklace is fabulous!!! Both you (unfinished) earrings and your necklace are stunning! I love how you added the roses into the design. It makes it just a touch romantic. Gorgeous! Wow! I really like your wire wrapping. I can't wait ti see the finished earrings. Great job! Really nice wirework. Those earrings are really going to be something when you've completed them. Don't go too crazy adding things, they're really great already. Love your earrings and necklace! - fantastic wire work! Beautiful creations, love that necklace! And it's nice to see so many of us Aussies in the BSBP!